It’s just 800 square feet, but new home in River Road area feels like a palace to Rob Handy and Julie Hulme. Give it up for ol’ Ben again. His waste-not, want-not maxim proves “spot on” in Rob Handy and Julie Hulme’s new one-bedroom, 800-square-foot home in north Eugene. Every square inch so counts in this hybrid timber-framed cottage, Handy and Hulme say they lack for nothing with livability. And this in a full-on dwelling smaller than many apartment units. “Small is beautiful,” says Hulme, effusive in her praise for the home’s designer, architect Nir Pearlson, and builder, Six Degrees Construction. In fact Hulme, a longtime teacher at Edgewood Elementary School in Eugene, and Handy, a Lane County commissioner, look at their home more as a spacious retreat than charming but cozy quarters. The property helps, too: a 2-plus acre lot with flowers, vegetables and fruit trees. But with abundant windows to absorb the verdant outdoors, with sloped ceilings of Douglas fir beams and hemlock decking, and with upscale but soothing finishes like reddish marble for the walk-in shower and a streambed of earth tones in the honed-granite kitchen counters, the house itself is “very calming,” Hulme says. The old home would become a giant recycling project before finally demolished. But first, Hulme gathered ideas for a new house from prominent author Sarah Susanka, an architect who studied at the University of Oregon. “I have all of her books. She was one of my inspirations,” says Hulme in reference to Susanka’s “The Not So Big House” series. Then, at the home show in Eugene, Hulme found a visionary soulmate in Pearlson. “Within a minute I knew, ‘This is the man who’s going to build our home,’” Hulme says. Before starting in, Pearlson spent time with Handy and Hulme, observing how they lived and asking about their lifestyle values. What emerged was the outline for a light-footprint, locally sourced, hyper-energy-efficient home with sustainable materials and quality conveniences befitting a lifetime home. To give Hulme and Handy their one small step up in square footage but giant leap in livability, Pearlson and his assistant designer, Rachel Auerbach, maximized “connectivity” between spaces. “Connectivity results in expansion,” he explains. From any one place in the great room, you can see to the other. Spaces are “separated” by physical elements, such as the wood stove that helps delineate living room from kitchen, and the curved dining bar that helps distinguish kitchen space from the front entry. No hallways or corridors means no wasted square footage. 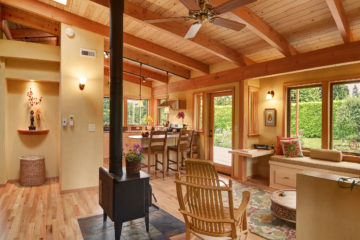 Vertical space soars, thanks to ramped ceilings framed with Douglas fir beams and hemlock decking. “That sense of exposed structure helps with the openness as well,” Pearlson says. French doors, each double glazed in a rainwater pattern, separate the home’s guest room from great room. But when left open, “the two rooms become one,” Pearlson says. Even when closed, transom windows above the guest room’s doors create a sense of expanding volume between both rooms. Perhaps most striking, the modest-size bathroom seems to expand before your eyes. First comes a curved, architectural glass wall, followed by a single sink pedestal, entry to the marble walk-in shower, stepped-up ceiling, and window view to the garden. Twenty-six windows connect earth and sky to indoor spaces, bringing daily joy to a couple who grow much of their own food and lace their grounds with flowers and fruit. “So much of our life revolves around being outside,” Hulme says while sitting on the home’s cedar deck, which also merges indoor/outdoor living spaces on two sides of the house. But her favorite connection of all in the house? There’s no dishwasher — “that’s called ‘Rob,’” Hulme quips — but the stainless-steel fridge and power gas stove help testify to upgrades made possible when building smaller. Spot on, that is, for splendid livability.